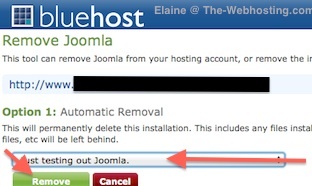 Joomla 2.5 is extremely easy to Uninstall in Bluehost. You no longer have to go through the process of deleting all the instances of Joomla 2.5. If you installed Joomla manually on other platforms, you would have to find and delete the MySQL Database, delete the MySQL Database user, delete all the files, delete the ftp username and more. In Bluehost, you can Uninstall Joomla 2.5 with a single click of a button and in 3 easy steps. Joomla 2.5 is already installed in your Bluehost account. You can manage your Installation in a central location in Bluehost under the heading ‘SimpleScripts Installation’. This brings us to the last step of the uninstall process. The ‘Remove Joomla’ screen removes Joomla from your hosting account, or removes the installation from Bluehost records. There are 2 options, 1- You can choose to remove your whole Joomla 2.5 installation, or Step 2 – Remove only the link in Step 1 and Step 2 and still keep your Joomla 2.5 files ad database. We will stick with Option 1. After you click on ‘Remove’, you will be taken to the Joomla 2.5 removal status bar. Once Joomla 2.5 is finished Uninstalling, all the Joomla 2.5 files, database and users will be deleted.